Home / About Energy Healing / What is Reiki? / What is a Reiki Attunement? The attunement process is a ceremony of spiritual awakening and introduction that celebrates the creation of a new connection between the student and Divine Source that aligns you with your Highest Good. During an attunement you are ‘tuned in’ to a different vibration of energy, a higher frequency. The attunement process also prepares your physical, emotional, mental and spiritual bodies for accepting and channeling the new vibration of Divine energy that will be flowing through you from the time of the attunement and after. The chakras are aligned, the physical organs and tissues are energized and healed and your spiritual channels to your Higher Self and your Divine are opened up and prepared for spiritual awakening. It’s a very personal and deeply spiritual process for many. A Reiki Master is the quickest and easiest way to receive a Reiki Attunement. A Reiki Master is someone who devotes themselves to attaining and maintaining a very high frequency of energy respective to the general masses. They have also been through all the training, attunements and Reiki practice to get them to the level of a Reiki Master/Teacher. A Master’s connection to the Universal flow of energy is high enough that he or she can create a stronger connection between you and the Universal flow. One of the unique characteristics of Reiki is its tradition of attuning people to the different levels of vibration that are represented in each degree. Attunements are short ceremonies in which the Reiki Master performs a sequence of acts that connect you to a greater flow of energy. I thought this diagram from another Reiki website was worth looking at. Usui Reiki attunement does the same things as this diagram. 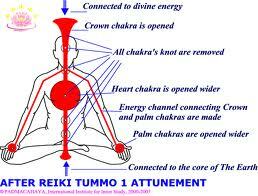 The ceremonies create an energy pattern around you when the Reiki Master imprints Reiki symbols into your aura. During the attunement process your energy system, chakras and meridians are adjusted and prepared for running this higher vibration of energy through your unique energy system. Your energy frequency adjusts to the higher frequency represented by the Reiki symbols. Once you receive the Reiki Attunement you will forever be able to run Reiki energy. However, it is much like anything else, if you do not use it you won’t lose it but you may forget how to use it. Or the energy may not run as much or as high a frequency as if you practice regularly. The more you use the Reiki energy the higher vibration energy you can run and the more energy your body can channel. Many people who have not used Reiki for a long time but want to now, choose to get another attunement or take another class to refresh their memories of the process of tuning into the Divine Energy. But, it is not necessary. If you still have your Reiki I manual, you can begin again on your own. Taking another class is a personal choice. Once you have taken a class from Josslyn any following classes of the same level are free to repeat just for this purpose. Each time you take another class and each time you get a new attunement, you learn more about yourself, your path and about Reiki. A personal story from Joss about spiritual beings being present during the attunements. 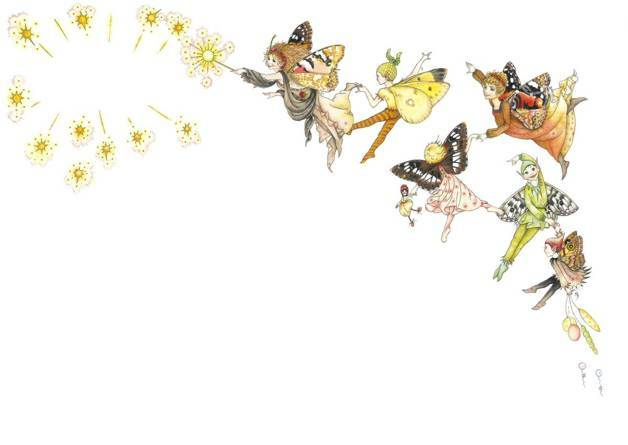 I remember clearly during my Reiki Master Attunement, the other student in class and I both saw and were aware of many fairies and other elemental beings singing and dancing and celebrating all around us during and shortly after our attunement. I had the feeling they were celebrating my coming back to Reiki. That I had been attuned to Reiki in another life and/or another place and they were putting on a big party in honor of my coming “home.” I loved it. It reminded me that not only is this a highly spiritual process but one worth celebrating with music and dance! Another excellent article, Joss…informative and your quotes, as always, very appropriate. I always enjoy reading your blogs! Thank you Pat. I am so appreciative of your loving support. Love and LIght to you and yours. Great to read this again! This is what drew me to the first reiki class. I believe I am in attunement with a spiritual guide. It is utterly beautiful and trying at times. This began 7 days ago. There are others with my guide and a spiritual energy vampire that has made me septic over the last five years. Will we make it through all the blocks made by this vampire? ?